Look Who’s Back is a nightmare tale, nicely directed by David Wnendt, with some particularly excellent editing by Hans Funck. What really would happen if Hitler came back to life? Would people take him seriously, or think he was a fake? Just how successful might his viewpoints and policies be in today’s day and age? Finding the answers to these questions is a funny and somewhat depressing journey. 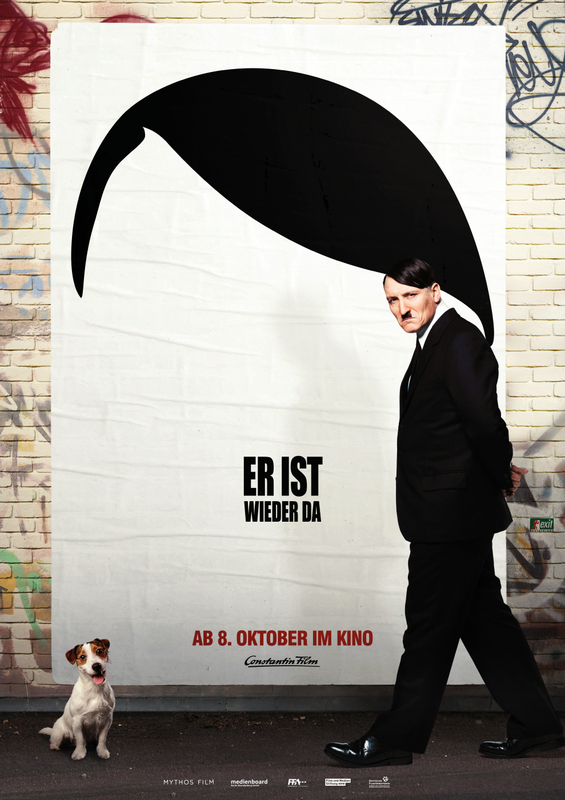 But this journey is peppered with laugh out loud moments, some genuinely funny characters, and clever gags at the expense of other films about Hitler himself (watch out for the amazing reference to Downfall). Oliver Mascucci inhabits the body of Adolf Hitler in a frighteningly authentic manner, even when discussing modern quandaries such as creating an email address and feeling the specific frustration of all your preferred usernames already being used. Look Who’s Back is the kind of film that is almost painfully funny. Funny in the sense that it has a darkly comedic sense of satire, and painful in that there are a lot of candid moments where people on the street don’t realise this satire and respond to the moustachioed man quite genuinely. In some ways, today’s modern political climate is the perfect time for a film like this to be released. The rapid rise of conservative political ideologies in response to debilitating global events such as war and terrorism is well-documented. It kind of makes sense that Hitler might choose to spontaneously come back at around this time, gasping for air in the carpark atop the site of his labyrinthine bunker in the middle of Berlin. Sometimes the film is a little bit obvious in making this point, but in other ways, Look Who’s Back is a clever play on the political boomerang effect from liberalism to conservativism during difficult times. Although towards the end the film can feel overly long or dragged out, it’s a journey that’s well worth embarking on. But this Hitler thing could never happen again, surely. We’re smarter now, aren’t we? How completely unrealistic would it be if some outrageous guy came onto the political scene all of a sudden and said a whole bunch of provocative and blatantly racist/misogynistic/bigoted things for laughs and for political gain? That kind of thing could only happen in a film like this, or back in the 30s. It could never happen in today’s day and age. Nope. Not at all. Not heard of it. Sounds quite different. It’s a very strange experience of a film. Totally. This kind of thing could never happen again. We’re much too smart for that. Well done. Great review. And so on. Thanks heaps! 😀 I actually own a copy of the book but I’ve never gotten around to reading it! It might stay on the to-read pile for a little bit longer! Been meaning to watch this for a while now. Good review! Thanks heaps! 😀 It’s a very interesting one indeed. Well I’m glad we all agree!! Love your pumpkin heads, by the way. Well… at the very least, I hope a vast majority agrees!! 😀 I also love cracking out the pumpkin heads, just in time for Halloween. I don’t normally reblog reviews that I’ve written recently. But given the political events of today, I felt this was necessary. ← Film Grimoire’s three year blogiversary!